La Cena Italiana is something of an institution for a group of expats who call Charlottesville their new home. We are quite the group actually: architects, winemakers, students, reporters, engineers, editors, software engineers, you name it. We tend to not be able to speak Italian during our busy work lives, so once we get together to reminisce about the old country, there is no English allowed. And we are quite strict about that. Problem is, I am beginning to forget words in Italian and resort to blurt them out in a heavily accented English. This month’s extravaganza had two special guests: one the member’s two sisters arrived from Italy the week before and were looking forward to hosting a night of Italian classics from appetizers to desserts. I was in charge of making tiramisu’ (which literally means “pick me up”), one of my favorites and well-practiced desserts in my repertoire. This is how the table was set when we arrived. 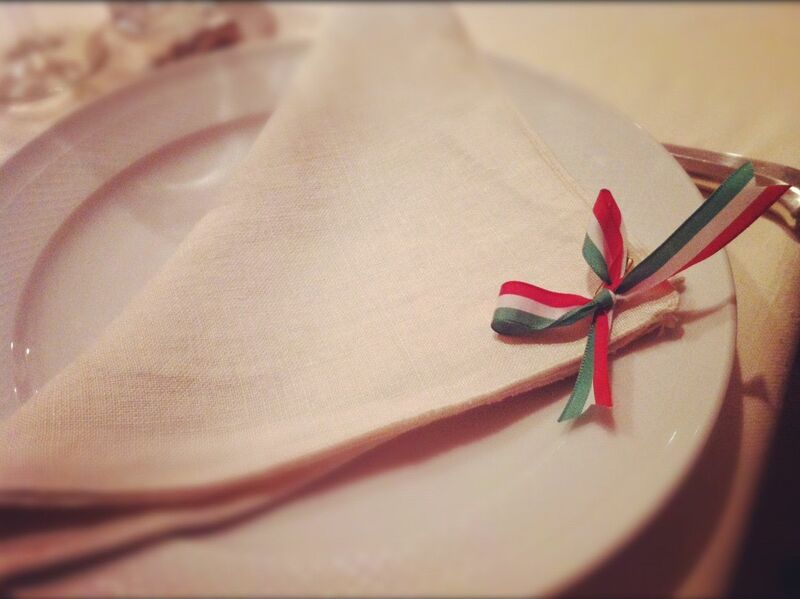 Green, white and red ribbons artfully paired with each napkin. This is how we do it. We go all out. After a few appetizers – bruschetta with grape tomatoes with a drizzle of excellent extra virgin olive oil, olives, and roasted cherry tomatoes stuffed with bread crumbs – i primi piatti were served. First up were homemade tagliatelle with a hint of extra virgin olive oil and baked artichoke hearts, a light and filling pasta dish from the Veneto region in Northern Italy. 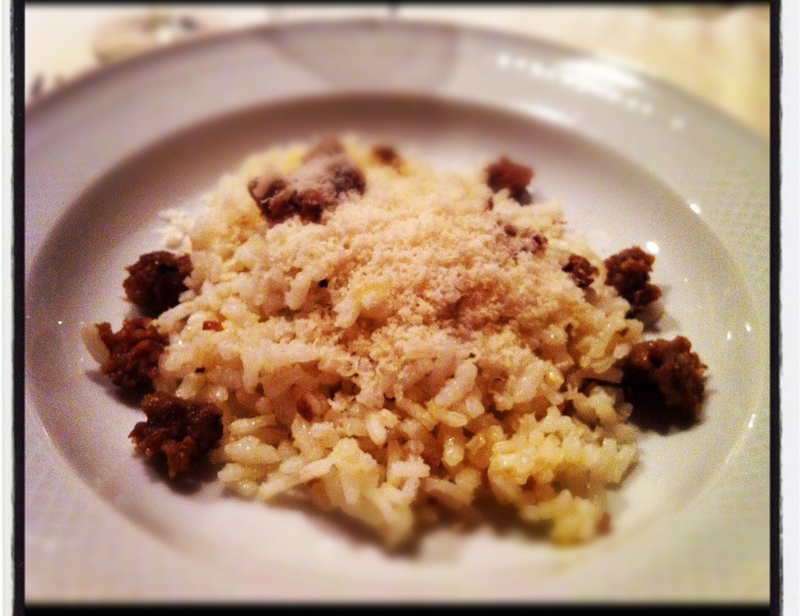 Next up, risotto with sausage. So simple, so unbelievable delicious. When I make this type of risotto, I usually add saffron to give it just a slightly bolder taste. And here is my favorite. Polenta. 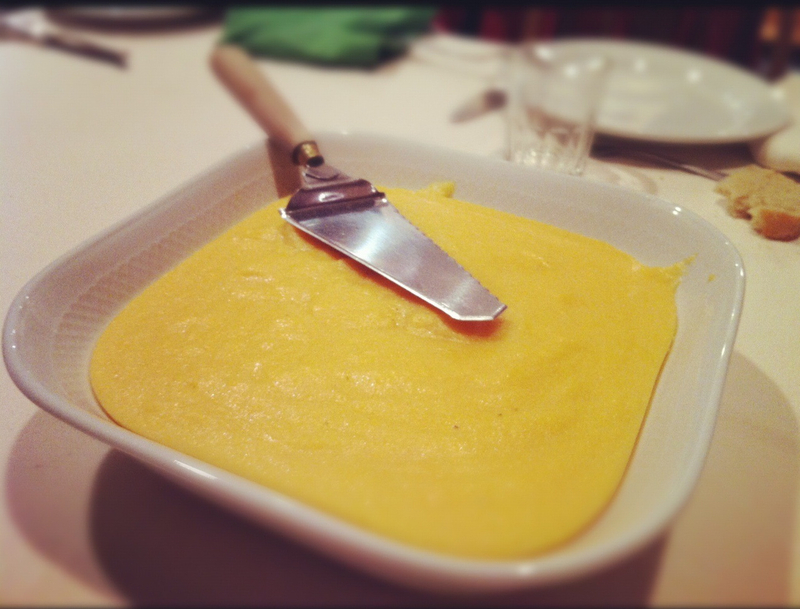 I grew up eating polenta…I love the taste, the texture, the color. Everything. I still remember my grandmother Pierina at the stove on Christmas morning stirring a huge pot of boiling polenta. We used to pair it with mushrooms and rabbit (I know, I know). The great thins about this dish is its versatility: it tastes even better the day after and it can be grilled, fried and boiled. This night, polenta was served with another staple of my family’s Christmas meal: spezzatino…chunks of meat with tomato sauce, potatoes and carrots. And finally, dessert. 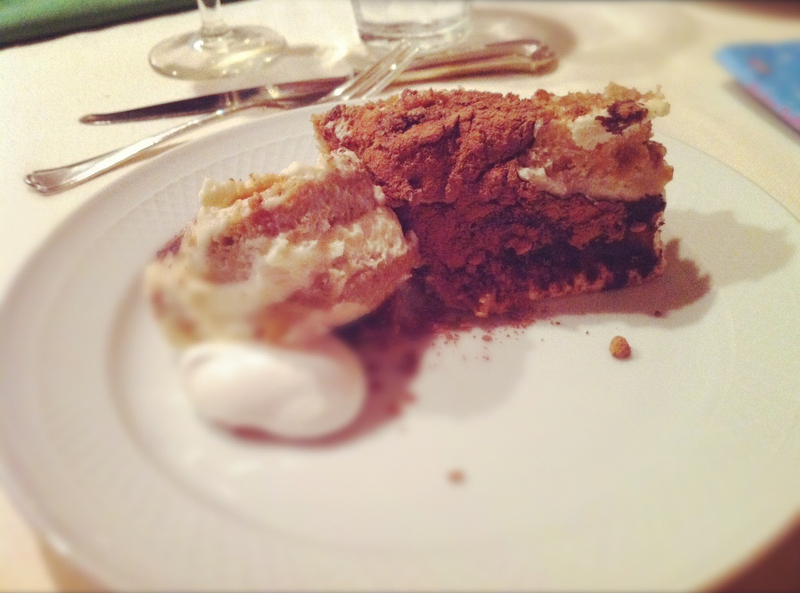 The tiramisu’ tasted great and everyone enjoyed it. (Phew!) But it wasn’t all. We had Gearharts chocolates, amazing nuggets of deliciousness, and meringues. 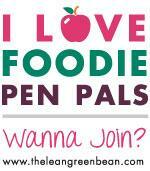 These dinners are so much more than just a food experience. 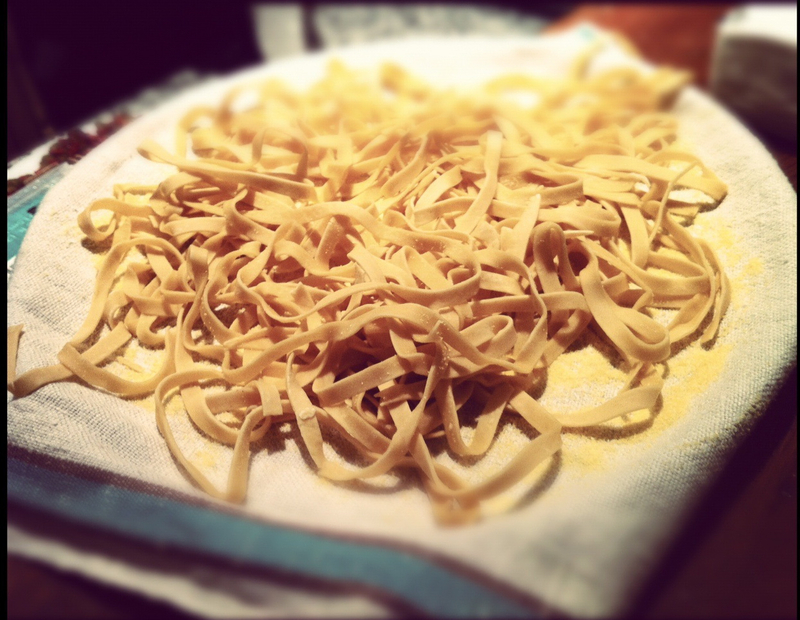 We may be thousands of miles away from our home country, but for one evening a month, Italy comes to us. You won’t believe I never liked polenta! I have something weird happening on my palate when I eat soft squashy foods like “budino, pure’, zuppa”. I know, it’s unbelievable coming from a woman coming from S.Agata where every kitchen on a winter Sunday morning had steamed windows and was filled of “polenta e casoeula” strong flavour! I understand the feeling of bringing Italy abroad through good food. Especially here where I struggle to find a real Italian red wine without screw top.